Thought prison time could keep this woman down? Not a chance. Martha Stewart is the woman who can do it all. Best-selling books, T.V. shows, retail goods, and homes – these are just a few of the things Stewart has in her portfolio. Adding to that, Plano based JCPenney has recently bought minority stake in Martha Stewart Living Omnimedia Inc. Plans to launch its store-within-a-store model and a joint website, are set to take off in 2013. 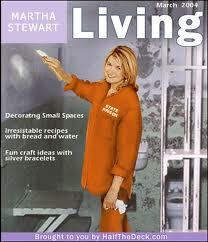 And here is a fun fact; Martha Stewart’s prison nickname was M.Diddy. M. Diddy & JCP, catchy right? Next in local news… If you think the Texas drivers are crazy, let’s talk about the roads! Just about every commute I take goes through construction of some kind. If you live or have driven anywhere near 121/183 in the Mid-Cities, you know the construction in this area is ever-changing to make way for the Northeast Tarrant Express project. Nearly every business in the area is being affected, and many have moved to other locations within their communities. In this article published by the Star-Telegram you can see the breakdown of different cities’ struggle to keep their businesses thriving. The project is expected to span 13.5 miles and cost nearly $2.5 billion. The North Tarrant Express website is a good source of information on closures and up-to-date activity of the construction. I, for one, will be happy when the construction ends. There have been several times I have almost gotten into accidents because of the uneven lanes. I wonder if there is anyone out there who has gotten into an accident because of the construction?